Deciding to visit Destin is an easy choice, but planning out your itinerary can be far more challenging. That's because there are so many amazing things to do in Destin, and an equally long list of attractions you'll want to see. Make it easier by picking the one thing that all ages will love: Destin pontoon boat charters. Take a closer look at five top reasons to make sure a pontoon boat charter, specifically a double-decker pontoon boat, is on your things-to-do list for your Destin vacation. 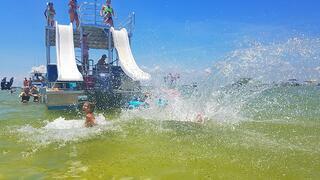 Kids and adults alike agree: Personal waterslides are one of the best things about chartering pontoon boats in Destin! With double-decker pontoon boats, there are TWO slides that extend off the upper deck down to the water. These slides create a seriously fun activity that will keep your group entertained for hours. Even better, using the slides is a breeze. The pontoon boat needs to be safely anchored in water that is at least waist deep, but that's really the only requirement. Prepare for lots of splashing and all the fun of a water park reserved just for you and your fellow passengers. Many visitors to Destin are interested in boat tours. There's no denying that spending the day on the water is the ultimate way to enjoy a vacation. However, boat tours and charters have some limitations. For those reasons, many visitors prefer private pontoon boat charters. You won't have to share the boat with anyone you don't know, and you'll have complete control over the day's itinerary. If you want to stop and do some fishing, go ahead! If the kids have had enough sun, rest in the shade for a while. Chartering a boat in Destin gives you complete control over your day. Trying to get the whole family involved while on vacation can be tricky. This is especially true if you're getting a big group together or you're trying to appeal to multiple generations at once. The great unifier for all ages is a Destin double-decker pontoon boat charter. To start, a double-decker pontoon boat is big enough for the whole family. Boats comfortably accommodate up to 12 people. Best of all, this is a memorable, exciting activity for children, teens, and adults. Crab Island may be the most exciting attraction in all of Destin. Pontoon boats are the best possible way to get to Crab Island. Located just a 10-minute boat ride from Destin Harbor, Crab Island is a submerged sandbar with a serious reputation for fun. Once you arrive at Crab Island, kick back and enjoy. Anchor the boat safely, and then soak up the sun while listening to music, go snorkeling, enjoy food from one of the floating food vendors, make new friends, and so much more. Kids will love to tackle the inflatable obstacle course, jump on the inflatable trampoline, and zoom down the inflatable giant slide. For many Florida visitors, seeing dolphins is a bucket list item. Rather than spotting dolphins in captivity, pontoon boat charters can allow you to see them in the wild. Dolphins are frequently spotted in and around Destin Harbor. Often seen in the morning and the evening, dolphins love to splash in the wake behind boats. Keep your eyes peeled, because there is a good chance that you'll see dolphins while enjoying the very best double-decker pontoon boat in Destin. At Double Fun Watersports, we want to help you have the best possible time in Destin. We’ve got new double-decker pontoon boats waiting on you. Contact us to reserve your pontoon boat today!